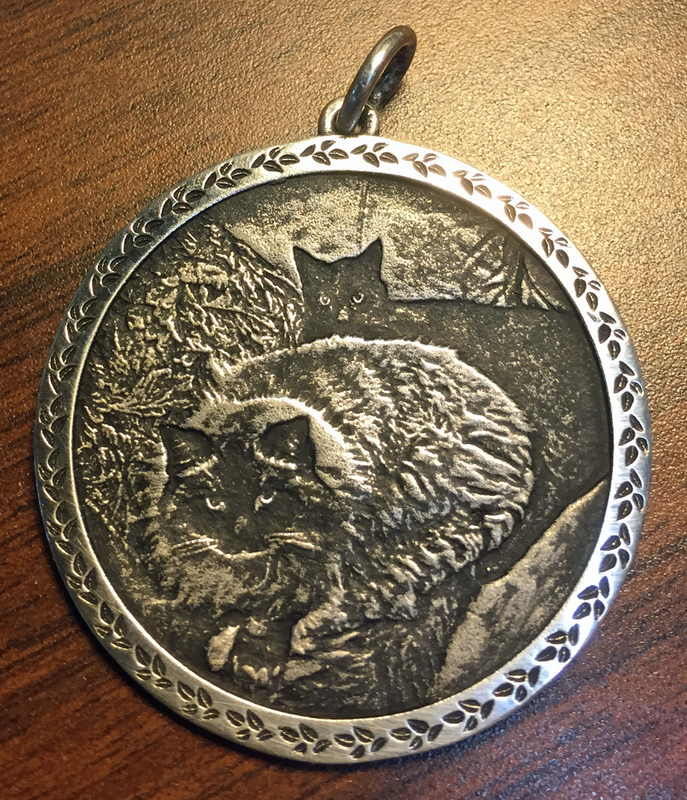 Click on an image to see it come to life in jewelry form! Thanks to the miracles of computer technology and the prodigious talent of our design team, Mardon is pleased to offer a memorable new type of jewelry. 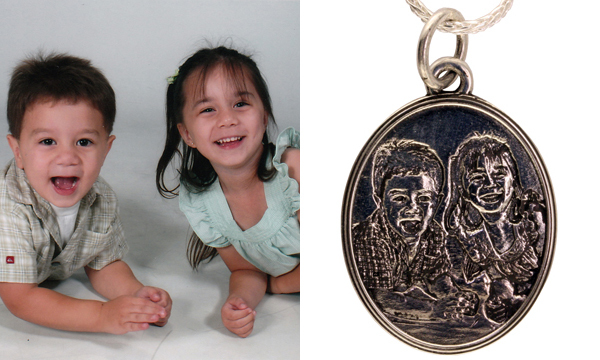 The Precious Portrait allows us to capture your photos directly in metal, creating a durable and unique keepsake that can usually be ready in just two weeks. The most popular type so far has been the pendant, but we can also make rings, keychains, pins, or anything else you'd like. Starting at just $295, it's a great gift for any occasion. Getting started is easy! The shape for the portrait. Popular choices include round, oval, square, and of course the heart. We can also do custom shapes! The size for the portrait. We have three recommended sizes, but since each piece is unique any dimensions can be used. The metal you’d like for your portrait. 14 or 18K gold alloys are available in yellow, white, rose, or peach; and our Argentium sterling silver is an affordable alternative that features minimal oxidizing. A border or frame. We have a number of premade border ideas, or we can create a custom style. 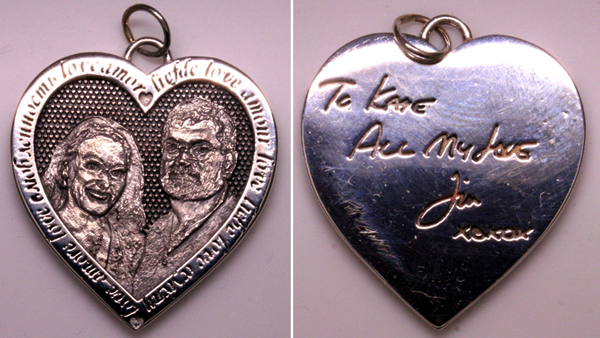 An optional inscription for the back. 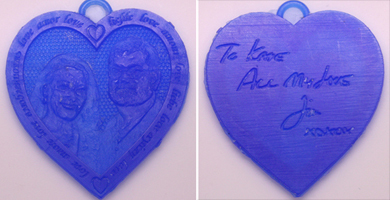 We can even make the inscription in your own handwriting! Just give us a copy of what you want to say written out on a piece of white paper. Once all the details have been determined, Mardon will provide you with a graphic rendering of the design for your approval. Revisions to the basic design are easy and are generally made at this stage. 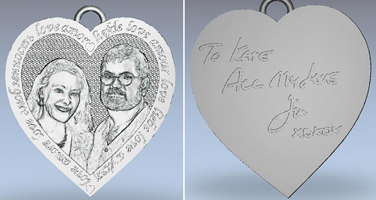 After you’ve approved the graphic design, we’ll create and show you the wax model that will be used to cast your portrait in precious metal. When you see the wax model, you can really get a good feel for the size and look of the finished piece. 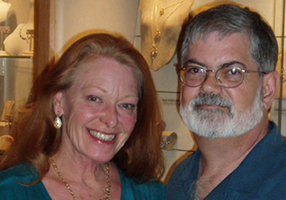 Once you approve the design and wax, we’ll cast and finish your Portrait promptly! Ready to start the process? Contact us today!